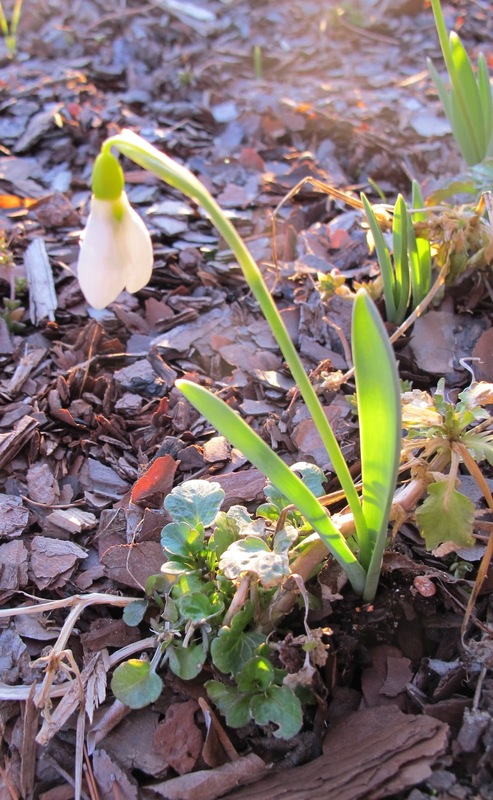 Welcome to Garden Bloggers' Bloom Day for February 2013. Here in my USDA Hardiness Zone 6a garden in central Indiana, winter continues. It seems at times like a roller coaster ride that goes up and down, up and down. You aren't sure when it will end, but you are pretty sure it isn't going to end soon enough. So you hang on and ride it out. 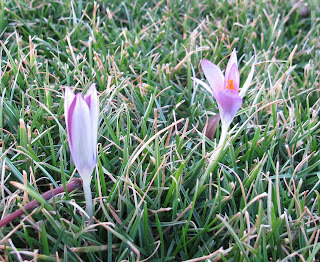 I went out to the back yard a few days ago and again today and discovered many crocus blooms in the lawn. I think, based on where these crocuses are, that they are ones I planted in the fall of 2011, and not the ones I planted last fall that I hope are slow enough to be in bloom for Easter on March 31st. I find that bulbs often bloom a bit later the first year they are planted, but even knowing that, I think I am being a bit optimistic to think that the rest of the crocuses will hold off until the end of March. I would guess that the grand display will be in about three weeks. Mark your calendars. Out in the front garden, I still have a lone snowdrop blooming. Crowding around its base are the leaves of a little viola. I hope as the snowdrop, Galanthus sp., fades, the viola grows and flowers. 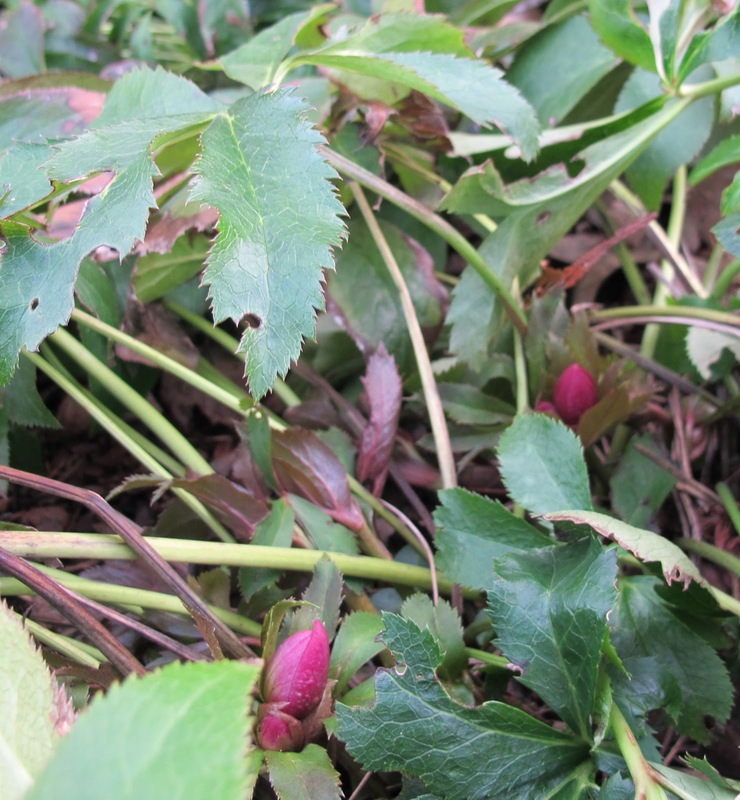 I kept looking around and found some hellebore buds. These are Helleborus orientalis, the Lenten Rose. I haven't cut back the old foliage, but will need to be careful not to cut off blooms when I do. I looked all over for an Iris reticulata in bloom, but they are so far just barely showing their leaves. In the race to bloom first in the spring, the crocus is the clear winner this year. 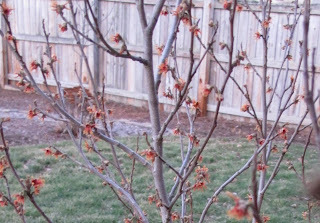 I thought the crocus, hellebores and snowdrop blooms were my only contributions for this bloom day, but then I remembered, just before sunset, that the witch hazel, Hamamelis vernalis, was probably blooming. And that's what's blooming in my garden on a pleasant February day, one that makes me think spring will soon be here. But I won't be a February fool, I know there is still more winter in this season, starting with snow in the forecast for late tonight and cold, seasonal temperatures predicted for tomorrow. What's blooming in your garden on this fine February day? We would love to hear about your garden and compare our blooms to yours for Garden Bloggers' Bloom Day. It's easy to participate. Just post on your blog about what is blooming in your garden now, then leave a comment below and add your link to the Mr. Linky widget. "We can have blooms nearly every month of the year." I've had camera trouble this winter, but I finally got it fixed last week, just in time for the flowers. I'm surprised enough by the flowers we have in NC this time of year so I'm amazed at the flowers that you have much farther north! I, too, desperately need to cut back the old foliage on the hellebores...but I just haven't found the time. Really, I'd much rather play with seedlings in the greenhouse right now. I'm envious of your witch hazel. Mine is just beginning to open, and I can't wait for its fragrance. Happy Bloom Day to you! While covered in a blanket of white here in the northeast we await for spring. Glad to see your prretty bulbs starting to show. Happy GBBD and thanks for hosting! Spring has arrived in my garden. I'm looking forward to seeing all the other gardens around the country and around the world. Happy Bloom Day, everyone. We also have snowdrops, hellebores, and witch hazel blooming in ourgardens here in zone 8 but I haven't seen a crocus anywhere around town yet. Happy Bloom Day Carol! I don't understand why people cut the foliage back on Hellebores. I think the leaves have a very interesting shape. My question is When and Why? Hi Carol, i am early to link now! Blogging makes me anticipate the arrival of the snowdrops, crocus, hellebores, witch hazels. My consciousness has been getting the wintery psyche most of you get, so that is the relevance of reading many temperate country blogs. I wonder if there are are even a few who wish to see my posts to keep them warm in winter! Wouldn't it be wonderful if we really could scratch the screen and get a sniff? Who knows - maybe that technology is just around the corner. Thanks for hosting Bloom Day, Carol! My goodness Carol what a half a zone can do for the blooms...still snow here so the bulbs and blooms are hiding. I love witch hazel... you almost make me wish it was winter here instead of summer so I could smell it! Happy GBBD! Can't believe you have crocuses in bloom already. In zone 9 London we have been in the grip of a cold period for the last 4 weeks and everything slowed down. And we were doing so fine in January! Thanks for hosting, happy GBBD! Isn't it great to see signs of spring on the horizon Carol even though as you say winter is not done yet. Good luck with cutting off the old hellebore foliage - I've cut off flower buds before and nearly cried. Happy GBBD to all. My crocus haven't even appeared yet here in Scotland and my snowdrops are just thinking about blooming but I still have flowers in bloom here outdoors. On my hellebores there is old drying foliage in late autumn...I just pull it off--it's ready to come off by then. The new foliage is growing in already, and the flowers follow after that a couple of months later. Such an easy plant. Happy seventh (!!) anniversary -- amazing! Hi Carol, Happy Birthday to Bloom Day, and whopping six years old now! Thank you for beginning this tradition of sharing our flowers in all twelve months. It is so enjoyable to participate and also to see what others have going on in their gardens or in their indoor gardens in winter. I will not be a February fool either, but I think my garden is past that point. Happy GBBD to you, and thank you for hosting. It is my experience too that newly planted bulbs are usually late. I hope your crocus can hold out for Easter. We really need a way to share the fragrances of the garden. Lots of beautiful hellebores and snowdrops this month with a few other stalwarts accompanying them. Very similar blooms in my PA garden this month as yours, Carol. Though I envy your witch hazel! I cannot wait to find a place for one soon. Lovin' your bulbs showing off already. I've got nothin'. I can't wait until next month when hopefully something will be blooming. I don't know why my crocus and snowbells are so sluggish this year, maybe because they were rushed out last year? Very pretty bulbs, so good to see them early. They don't grow well where I am. We've had a mild winter so I have summer annuals still blooming! I thought a few things were coming early until I looked at last years post! Thanks so much for hosting, GBBD has helped me tremendously in planning, and keeping up with my garden! Our Lenten Rose isn't flowering yet but another hellebore is. Love the snowdrops and crocuses! Hope you are having a good day. Are you ready for warm weather and Spring? I am always a "February fool" as you call it - I always expect warm weather, and am surprised when we're hit with an unexpected cold front. I love your little blooms - especially that poor little lone snowdrop. I hope soon his friends will come out and play with him! I love reticulated iris. I am also in love with your witch hazel. I have a common one, a few years young on which the rabbit likes to dine. The rabbit ate my azalea blooms. I'm beginning to think hossenfeffer. I can't wait to see crocus. 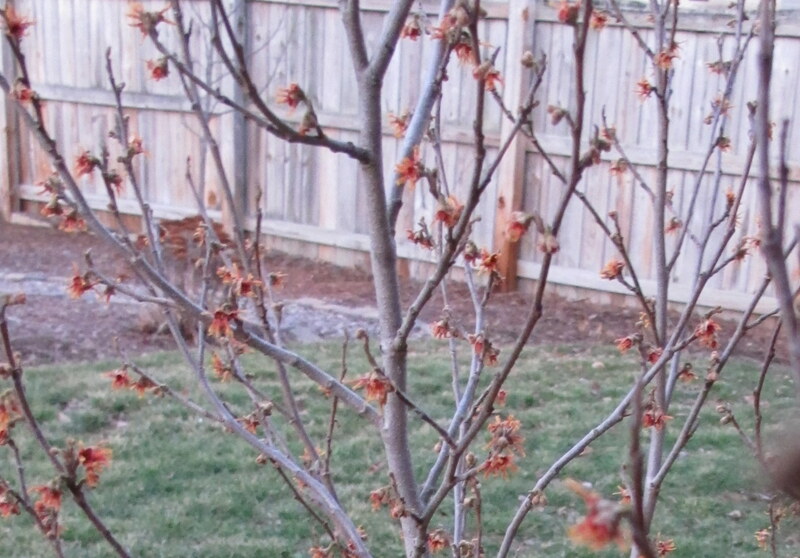 It's that time of year...when I wish I had room for a Hamamelis in my garden, happy Bloomday Carol! I'm jealous of your hellebores. I've not had much success. All my blooms are yellow at the moment - aconite and crocus. 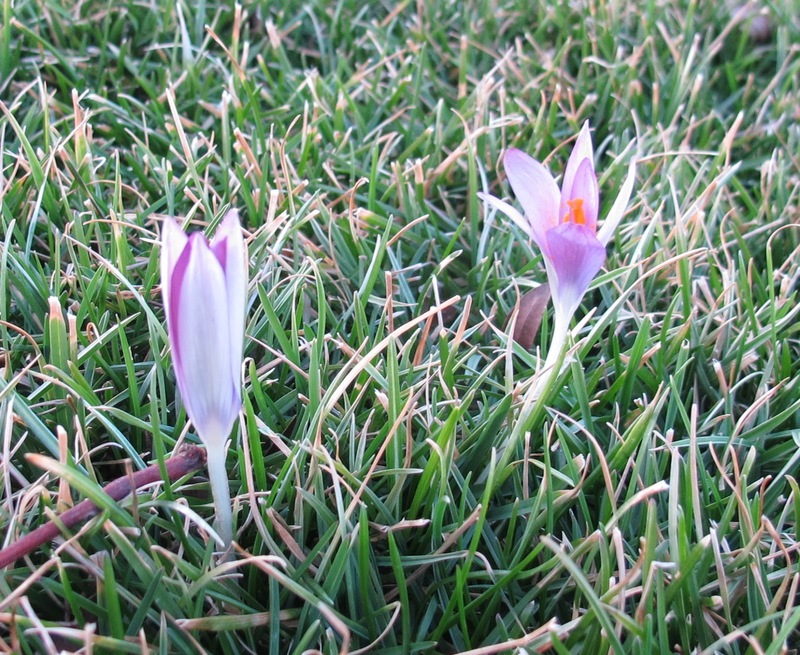 What a great surprise to have Crocus coming up in the lawn! Your hard work is starting to pay off. How many bulbs are you up to now in the great lawn project? Thanks so much, its a joy to share with all the many gardeners out there! My first attempt at GBBD, see I need to add more narrative next time. I have to say that I was quite surprised by the amount of flowers that were around, just shows that I take to much for granted when strolling around my garden. My first crocus just peeked its head up! Hi Carol, this is my first time to link up with you, and I'm looking forward to meeting everyone. Happy Bloom Day! There's a lot blooming in North Carolina already, but we're in for temperatures in the teens this weekend. Boo! Only 23 days until Spring, though. Can't wait. My first time linking up. The only thing that blooms in my Ohio garden in February is hellebores. Hopefully I'll have more next month. I am amazed that GBBD is 7 years old. Doesn't time fly? As in the garden, there are a few little blooms here and there. I am so grateful to see them as I know you are. I have the same subjects blooming here. Happy GBBD. Happy GBBD Carol. Crocuses are my favourite Spring bulb. I love this time of year, as the days get perceptibly longer and more and more bulbs show themselves. Roll on Spring proper! It's been a while since I've had time to participate in the GBBD, but decided to bottle up a little spring to share with everyone. Thank you for hosting for seven years!! Happy Spring -- it can't be too far off, can it? We are on that same roller coaster ride as yourself. Tonight it will freeze! Oh! those pretty little fuschia colored buds. I keep looking at my one hellebore and see nothing. It hates life in Texas. Thanks for hosting GBBD for seven years, Carol! Our weather is still trying to make up its mind too - I can't wait for spring to start! Here in upstate NY, it's been a roller coaster ride, too. But today it was sunny and we got up to 47 degrees - unbelievable. The snow is melting and most of the ground is bare. And, my flowering plants indoors are happy. It's not much but with the Hellebores buried under a foot or two of snow, it's all I've got. Happy GBBD! I could be living in a USDA Hardiness Zone 6a garden in central Indiana. I have the very same blooms as you though I would have had to borrow a witch hazel. I haven't got mine yet. Virginia and Indiana appear to have a lot in common this month. I really enjoy the opportunity to see what's blooming in so many different gardens, Thank you, Carol, for making it possible! Spring is just around the corner here, but winter is lingering on. However, there are still some spots of color. My garden is a mess! I have a few flowers so I'll probably put up a post, even though a bit late. Have just recently discovered your fun link party and decided to join in. I apologize as my first attempt (#83)was linked incorrectly. I enjoyed seeing what is blooming in your garden and look forward to doing some more visiting this afternoon. I'm hoping to add hellebores to my garden soon. Your crocuses are amazing, Carol! I keep looking for signs of mine here, but they are still bundled up waiting for warmer weather, I guess. Thanks for adding the scratch and sniff--the witch hazel smells divine! Congratulations on your seventh year! I'm sharing mostly hebes this month. Congrats on seven years, Carol! I have enjoyed participating for most of the past three years. My garden is slow to warm up this year and many of my bloomers are the same as last months'! Seven years is an amazing run, Carol. Congratulations and happy February Bloom Day. Well done on 7 years. I've just posted my first GBBD - thank you! My post is finally up. Happy gardening! Every month I am at least a day late! I love your witch hazel. I have 2, but neither are in bloom yet. Well, I've been away from bloom day for a bit, but this month I could not resist. What a joy to find that May Dreams Garden is hosting bloom day just as always. Thanks so much, Carol! Hi Carol, thank you for the invite to Bloggers Bloom Day. My first time here so hope I did it right. Still winter here so indoor blooms are still where it's at. Lynne from Canada. Seems you are betwixt and between this Month, Carol. February is when things start to pick up along the California Central Coast region - Thanks as ever for hosting!